the other is on Liquid Atomization, Spray, and Fuel Injection in Aircraft Gas Turbine Engines which is for two days and sponsored by the American Institute of Aeronautics and Astronautics (https://propulsionenergy.aiaa.org/Liquid-Atomization-Spray-and-Fuel-Injection/). Left: The sequentional combustion system for GT24/GT26 by Alstom. However, what is explained below is a "detailed" version of the one sponsored by the ASME. Emission of pollutants from gas turbine engines, whether they are implemented for use in aircrafts, ground-based energy conversion, or for mechanical drive applications, is one of the grand challenges of our time. By most estimates, energy conversion through combustion of fuels in gas turbines will remain one of the most important technologies in foreseeable future. Hence, design strategies for many gas turbine components, specifically combustors and fuel nozzles, are heavily guided by approaches to reduce and/or control the amount of regulated pollutants exhausted into the atmosphere. While there are commonalities between the two class of engines (i.e., aircraft and ground-based), there are sufficient differences in their low-emission technologies that worth consideration of both in one coherent and contrasting presentation. Therefore, it is the main objective of this seminar to present a balanced coverage of both aircraft and ground-based gas turbine engines in which commonalities and differences are described and highlighted to guide current and future low-emission design strategies. Also, the course takes the view that thorough understanding of the formation mechanisms for the regulated pollutants is critical for intelligent and efficient engineering design strategies as well as for effective current and future technology development efforts. For this reason, the presentation, after a broad coverage of the requirements imposed on combustors in terms of metrics, constraints, and system interactions for both engine types, delves into the current understanding of how these pollutants (i.e., carbonaceous particulate matter, CO, and NOx) are produced within the combustion chambers. This is especially important to those who are new in the field, desire to fill knowledge gap with recently-developed understanding, or wish to migrate/expand from other engines, such as reciprocating internal combustion engines, into gas turbine emissions. In the last part of the seminar, the attendees experience the interplay between essential understanding of combustion and emission of pollutants covered earlier and its transformation into the design of the current and future combustors in the context of aircraft and ground-based engines. Here, topics such as premixed or partially-premixed combustors designs, staging in lean-premixed prevaporized (LPP) mixture and its consequences on designs of the combustor components, prevaporization issues, degree of mixture homogeneity, combustion efficiency, lean stability, autoignition, flashback, fuel nozzles, and lean direct injection (LDI) are covered. Operability issues (such as, part-load emissions, stability and lean blowout, ignition, thermal managements, pattern factor, combustor pressure losses, combustion oscillations, and alternative fuels) are also presented. After a thorough summary of the fundamental processes common in such engines, this three-day courses concludes with a comprehensive treatment of the conventional, nonpremixed, and dry low-NOx (DLN) combustor design strategies for ground-based gas turbines. 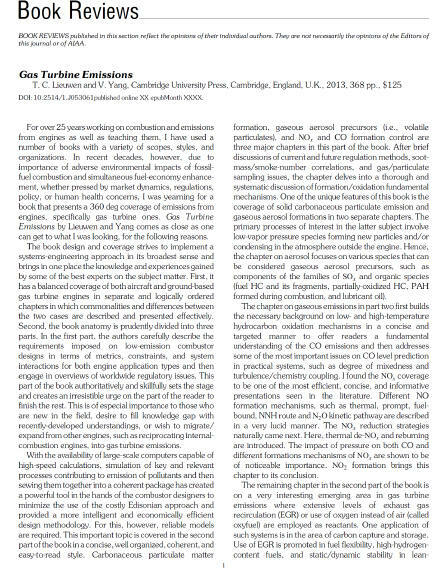 In essence, the last part of the presentation (both for aircraft and ground-based engines) covers case studies from manufacturers and technology developers, emphasizing the system-level and practical issues that must be addressed in developing different types of gas turbines that emit pollutants at acceptable levels. Individuals interested in this seminar should contact either the American Society of Mechanical Engineers (ASME.org) or Advanced Technology Consultants (ATC) directly. Due to ATC's low overhead, direct-contact clients are offered a competitive and cost-effective package. Electronic and hard copies of the seminar materials can be purchased and are only available through ATC. Contact ATC for price and shipping. NOTE: Professionally-prepared "audio-video Powerpoint-type presentations" of these seminars are available for purchase by companies. Each slide is presented with a clear audio by the consultant, describing the subject, while a digital pointer guides the audience to where the attention is to be focused. Companies can put such audio-video presentations on their intranet to be used by their employees. It is a cost effective way approaching professional training, which also contributes towards R&D, design, and intelligent new product development efforts. Presentations are updated every year at a fraction of the original cost. For a sample presentation click on the word "IGNITION" in the picture to get a feel of how information is transferred (High-speed internet access is recommended. Otherwise, download may take a few more minutes). The actual copy sold is of high resolution with high quality sound. For more details and pricing please contact ATC. Design, application, and test engineers, researchers, scientists, and technical managers who are, or will be, involved in the low-emission gas turbine engine technology projects pertaining to aircraft and ground-based engines. People with both modeling/simulation and experimental orientations will benefit from the seminar. 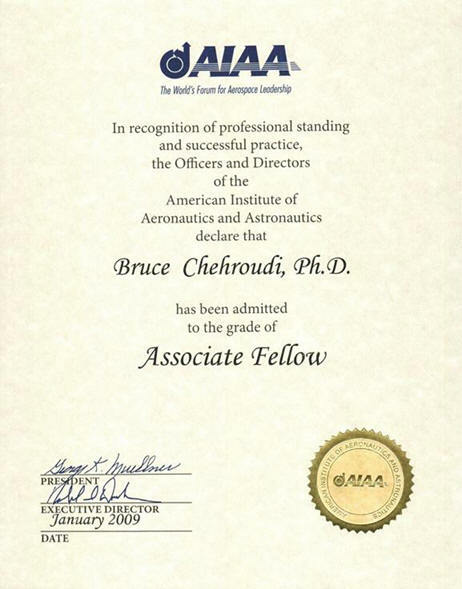 A BS degree in mechanical, chemical, aeronautical, or aerospace engineering, or combination of relevant experience and education. Due to ATC's low overhead, direct-contact clients are offered a competitive and cost-effective package. Individuals interested in these seminars should contact Advanced Technology Consultants (ATC) directly. Alternatively, this seminar (prepared by the ATC and delivered by a award-winning ATC consultant) are also to be sponsored soon by the American Society of Mechanical Engineers (www.ASME.org).